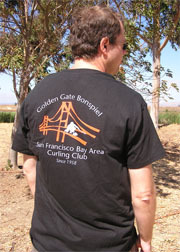 Look sharp and show your club pride at league or at a bonspiel in SFBACC logo clothing. Profits from sales fund SFBACC programs and equipment. For a limited time, "Rainbow House" t-shirts can be purchased online. To order and for size information, email merch@bayareacurling.com. From left to right: Golden Gate Bonspiel tee; SFBACC signature short sleeve polo; SFBACC signature fleece vest; SFBACC signature short sleeve polo; SFBACC signature long sleeve polo. All pieces are perfect for men and women. SFBACC signature fleece vest (men's, black). Sizes currently available: S, M, L, XL. Price: $60-$80 depending on style. 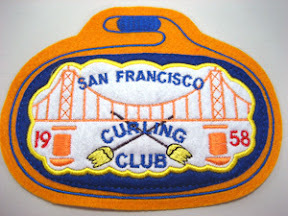 For pricing and to purchase club jackets, contact merch@bayareacurling.com. Prices are based on meeting minimum order requirements.